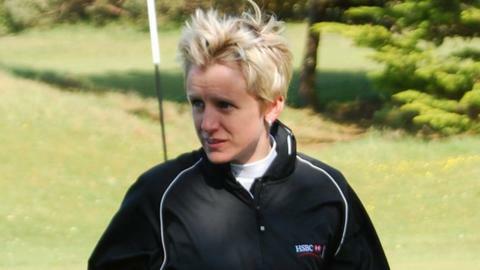 Alex Mollin says she feels "privileged" to have become the first female teaching professional at the Royal Jersey club in its 138-year history. The 37-year-old, who turned professional in 2010, started her job at the course last month. "Coaching is a man's world generally, so to be able to come here and join a fantastic team - it's a great honour," Mollin told BBC Channel Islands. "There are so few women coaches in the grand scheme of things." To become a Professional Golfers' Association professional, players have to complete a three-year degree course, as well as obtaining other qualifications. Royal Jersey's Olivia Jordan-Higgins is currently playing on the Symetra Tour in the United States and attempting to win a card for the main LPGA tour. "When I go away to the PGA and do my training, I'd be in a class of around 360 trainees and probably a dozen of those were women - so you're in a massive minority really," added Mollin. "It's fantastic and it's a privilege. I think it was always going to happen at some stage and for me, it's a fantastic achievement to be that person."